What Every Parent Needs To Know About Cyberbullying! IPads will be a staple in many schools by 2014. The Obama administration encourages it as an aid for educating our kids in the classroom. Though we want our kids to be fluent computer users, the internet is not always regulated for the younger generation. Or at least not as much as parents would like it to be. Kids have access to technology and with that comes the use of social media. Using technology provides a way for kids to be more social online. However, it can enhance a false sense of confidence. Additionally, it can lead to an increase in cyberbullying victims. After watching a movie on Netflix called Cyberbully, I began to think about the repercussions of social media on kids. The movie depicts a high school girl who is bullied by a mysterious friend on Facebook. Soon other students begin to chime in and humiliate the girl. The bullying pushes the girl to her emotional limit. More and more, kids are getting carried away with their words. If you are angry with a friend, think of how easy it is to shoot off a text or post something in the heat of your anger. I think kids are much less likely to say hurtful things to another kid when they are face to face and have had some time to cool down. It’s fun to socialize. According to Web Wise Kids, 93% of teens ages 12-17 years old go online and 73% of kids use social networks. The average teen has over 200 Facebook friends. What I find very interesting, is since 2010 the percentage of teens who own cell phones has increased by 45%. A majority of social media activity occurs on mobile devices such as a cell phone or iPad. Data shows that 97% of middle school students who take part in social media have been bullied online. Only 10% of those students report the abuse to his or her parents. 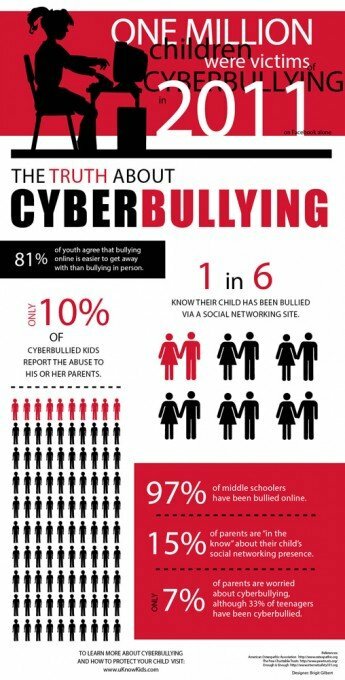 Cyberbullying is a serious form of emotional bullying that can lead to tragedy if not addressed with your children. Take a look at this infographic on the KnowKids.com website that describes facts about bullying. The figures astonished me. Therefore, you should discuss cyberbullying with your children. According to the National Crime Prevention Council, parents can help to stop bullying on line by discussing a plan of action with them. Most importantly stay involved with your kids and tell them that you need to have access to their devices. Only 10% of students who are bullied tell their parents. Discussing a plan of action with your children can keep them safe. Teacher Appreciation Week Kudos From Screenflex!